A number of recipes call for chocolate shavings, and you may be wondering how to make chocolate shavings. Perhaps the last time you tried, you used a the traditional method with a giant knife, cut yourself and thought, there's got to be a better way! Good news - there are safe ways of making chocolate shavings that don't involve scraping a frighteningly large butcher knife down a bar of chocolate towards your body. Learning how to make chocolate shavings doesn't need to be death defying. As a matter of fact, once you have the right set up and tools, it isn't even very difficult. Before learning how to make chocolate shavings, here are the best conditions and types of chocolates for making shavings. There are a number of types of chocolate that are perfect for making chocolate shavings. You can use any type or brand of chocolate including dark chocolate, milk chocolate and white chocolate. Purchase your chocolate in block form. You can usually find bulk blocks of chocolate wrapped at most grocery and specialty stores. 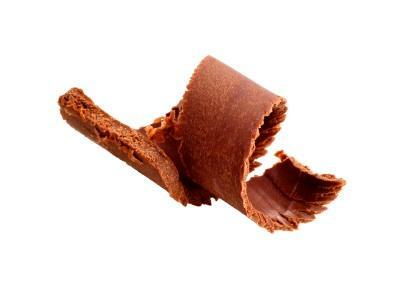 Chocolate bars don't work well for this type of work - your shavings will either wind up too thin or broken. Before shaving the chocolate, chill it for several hours in the refrigerator. Working with room temperature chocolate will only result in thick, broken, chunky pieces of chocolate instead of thin, delicate shavings. Use a pastry bench scraper. This broad handled, flat tool has a nice edge that isn't too sharp or dangerous, but is sharp enough to shave the chocolate. To use the bench scraper, place the block of chocolate on a piece of paper towel set on your parchment (the paper towel will keep the chocolate from sliding) and scrape the bench scraper down the flat surface of chocolate towards you. This method is terrific for making a large amount of chocolate shavings all at once. The shavings will be small, flat, and thin. Use a melon baller for shavings with a little bit of a curve to them. The downside to this method is that you can only make one shaving at a time, but the shavings are pretty with a nice shape to them. To make chocolate shavings with a melon baller, place the bar on a piece of paper towel on the parchment paper, and lightly scrape the scoop across the surface of the chocolate. Use a vegetable peeler. This method yields pretty chocolate curls - like pieces of curled ribbon. The downside is that you can only make a single shaving at the time; however, you can make long curled shavings. To use a vegetable peeler, hold the bar of chocolate in one hand (you may want to use a paper towel to avoid having the chocolate melt on your hands) and scrape the peeler across the edge of the chocolate block. Use the edge of a large spoon. Place the chocolate on a paper towel set on parchment and apply a slight pressure to the edge of the spoon. Begin to rotate the spoon counterclockwise across the surface of the chocolate as you apply pressure. Vary the length of the strokes to change the size and shape of your chocolate shavings. If you're looking for more of a wide chocolate curl to garnish your dessert, TLC Cooking offers this simple method for making pretty chocolate curl garnishes. If you find you made too many chocolate shavings, the chocolate can be stored. Store it in a covered container or a Ziploc bag in the refrigerator. The shavings will keep indefinitely if properly sealed and stored. Chocolate shavings can be used for a variety of desserts. For example, you can press chocolate shavings into chocolate frosting for a pretty cake or use them to garnish pastries. Using the above methods, you can make beautiful chocolate shavings without needing to risk life and limb with a sharp knife.